Modern luxury and rustic simplicity are married in this off-grid geodesic dome on a smallholding Limousin. Le Monteil Revolution is a tiny hidden farm, dating back to 1792 and the French Revolution (hence the name). It has survived over the years and has been brought back to life by its new owners Charley and Calum. Only 15 minutes drive from Chabrières, Le Monteil Revolution has nature at its heart with deer, owls and badgers threading their way among the woods at night. Flora and fungi don't disappoint either which are abound within the rolling hills and woods of the site. This glamping dome, called Rocher, can accommodate up to 4 people and is most suitable for couples or young families. It comes kitted with a king sized bed, double sofa bed and all of the bedding you could need to to keep you snug and cosy, a wood burning stove and a bay window to admire those views looking out over the trees. You can also enjoy the view from your very own private decking and the private bathroom with hot showers and drying area are a short stroll away. Combining traditional stonework with modern materials and appliances the newly appointed kitchen is both stylish and functional. It comes fully equipped with integrated fridge/freezer, double oven with grill, microwave and four ring electric hob. Each dome has its own crockery, glassware, and cutlery for use and there are plenty of cooking utensils and pots and pans to go round. The basic condiments you need are fully stocked for your stay as well as washing up and cleaning materials. There is a separate dining room next door to the kitchen and there is also a gravelled dining space outdoors positioned so you can enjoy the very best of the sun. As well as access to WIFI there is a tv and radio in the snug/dining room if you want to catch up on anything. To help Le Monteil stay as green as possible, guests are encouraged to use the different bins, recycling and that all important compost! For those that want to enjoy the outdoor cooking experience then guests are encouraged to make full use of the summer kitchen. The reclaimed granite worktops are perfectly positioned to cook whilst looking out over the land, and the three walls of the summer kitchen are an excellent sun trap. There is a cool box for any food that needs to stay chilled, as well as a separate area for drinks. There is a small sink for prepping food and compost bins for any veg peelings you have. There is also a gas bbq available to cook on and a Kadai (traditional Indian cooking bowl) with tripod and grills for those who want to cook over an open flame. The Kadai also doubles up as a great place to chat and drink long into the evening once dinner is over. There is plenty of seating in the summer kitchen or you are more than welcome to use any of the other dining areas on site to enjoy your meal. Positioned towards the rear of the summer kitchen is the herb and edible flower garden. Guests are welcome to use any of the tasty treats that can be found here and if you have any questions on what any of them are then just give Charley or Calum a shout! Rocher has its very own wooden hot tub which is set amongst the trees and sheltered by one of our fantastic boulders, allowing for a private bathing experience, surrounded by nature, immersed in chemical free and wood-fired heated water. The resident pigs and donkeys are a happy bunch, whilst the chickens provide the fresh eggs available to residents, and the small honesty shop allows you to buy the seasonal home grown fresh fruit and vegetables. Being keen cyclists and walkers, Charley and Calum, can offer guidance on the best local trails with maps for both hiking and cycling. Some of these routes start right at the entrance of the glampsite. Pack your boots and/or cycling gear, and don't forget your binoculars for the wildlife. Please be aware that there will be a taxe de séjour to be paid in French campsites. This Holiday Accommodation Tourist Tax for your holiday must to be paid in the campsite with a minimum and maximum range set between from €0.20 to €1.50 person/night. Roam Freely. Breathe Easy. Think Clearly. Luxury geodome glamping and cycling holidays on a smallholding in the Limousin region of France. Do you want to stay in the great outdoors but don’t want to give up life’s little luxuries? Well at Le Monteil Revolution you don’t have to! Our Geodesic Domes Rocher and Châtaigne enable you to sleep under the stars in total comfort all year round. Each dome also comes with its own private decking and its very own wood fired hot tub which has completely chemical free water for the ultimate outdoor bathing experience. Not only do we know how important a good night’s sleep is, but we also know how annoying queuing for the shower in the morning can be. That is why everyone at Le Monteil Revolution gets their own stylish private bathroom complete with towels, toiletries and hairdryer. The choice between the fully equipped communal kitchen and the outdoor summer kitchen mean that you won’t have to pack the kitchen sink either! Our dream is to create a space where people can truly relax. Where they can discover things about themselves and the world around them that modern day life may prohibit. This is why we encourage everyone who visits to explore the natural wonder and beauty that Le Monteil and the surrounding area has to offer, be it on foot or by bike. It is also why we try to minimise our impact on the environment working with and harnessing our natural surroundings wherever possible. 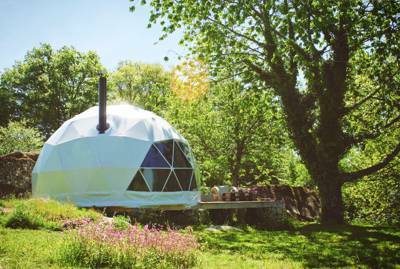 Domes have insulation and ventilation, a wood-burning stove, beds (bedding and linen provided) and outdoor decking. Each have a private bathroom with a shower, sink, toiletries, hair-dryer and plug sockets. Laundry facilities – a washing machine, dryer and a covered outside hanging space. Individual outdoor wood-heated hot tubs situated within a secluded spot close to your dome. Free Wi-Fi. Access to a modern, fully equipped indoor kitchen and an outdoor kitchen with a kadai (cooking bowl/fire pit), a gas hob, a sink and herb garden. Le Monteil Revolution is a working smallholding with chickens, goats and pigs and the owners are more than happy for guests to be 'hands on' if they wish. Guests can also collect eggs from their very own hens each morning. Campfires not permitted, however there is an outdoor fire pit for cooking use or sitting around in the communal outdoor kitchen area. There are several great walks from the doorstep (maps are available for use on request), or head a little further to the Monts de Gueret for the best forest routes, as well as the opportunity to try mountain biking or horse riding. If you really want to stretch your legs, you can go get lost inside the world's biggest hedge maze, the Labyrinthe Geant (04 42 22 19 15), a 10-minute drive away. Take some bread crumbs so you can find your way back out again. It's just 15 minutes to the Loups de Chabrieres (05 55 81 23 23; also called the Monts de Gueret Animal Park), the 32-acre public wildlife park where the wolves are found. Arrive in time for the 'feeding show' to get the best views of them. For culture vultures, the nearest museums are the Tapestry Museum (05 55 83 08 30) at Aubusson, the Resistance Museum (05 55 69 48 75) at Peyrat-Le-Chateau and the Museum of Art and Archaeology (05 55 52 07 20) in Gueret. Homegrown produce from the farm is available to buy, including vegetables, fruit and meat – all depending on the time of year. Restaurant Influence (05 55 81 98 32) is a 7 minute drive away and the campsite even offers a taxi service for guests who would like to sample the wine menu! They have a seasonal menu for both lunch and dinner – it's excellent value for money. The medieval town of Bourganeuf is a 15 minute drive away and has a small supermarket. Its Wednesday morning open air market is particularly good for purchasing local produce or indeed just watching rural France in full swing with a cup of coffee in one of the many market-side cafés. Head a little further to Gueret for larger supermarkets and a wider restaurant selection. From central Gueret follow signs to the Loup de Chabrieres out of town on the D940. Continue along this road past the Loup de Chabrieres and Labyrinthe Geant for another 8km until you see a sign on the right for the D940A St Eloi and Chapelle-Taillefert. Continue along this road for 10 km, you will go through various hamlets along the way. Once you reach the hamlet of Coeurgne and crest the hill, there will be a sign on your right handside for Le Monteil. Take this turning and drive for 700m from the main road, then turning left following the signposts to Le Monteil. You will drive past a barn on the left hand side and house on the right, Le Monteil Revolution is signposted on the left after these. Regular flights with Ryanair and FlyBe operate to Limoges airport and there are hire car facilities there. The nearest TGV station is La Souterraine. 2 geodomes, sleeping up to 4 people in each. Rocher has one king size bed and one double sofa bed. Châtaigne has one double bed and two single beds.